Django Jones leapt onto the pages of Little Girl Gone fully developed, smiling and ready for his close up. He’s almost thirteen and though he’s an orphan now, he had the good fortune to be raised by a glamorous mom and dad who adored him in the best way. His father, Jackie, was a world famous rock guitarist. A very fictionalized Sting, if you will. 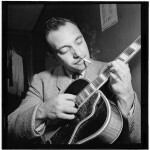 And Django – the D in his name is silent — was named to honor another great guitarist, Django Reinhardt. Django suffers a great loss and I love how deeply he feels it, his resilience and the sense of right and wrong that Jackie and Caro Jones instilled in him. When he defends the pit bull, Foo, I cheer, but I fear for him too because innocence has to be tested. Will his survive? I didn’t know the answer to that question when I began writing Little Girl Gone. Everything depended on the kind of sparks that flew up between him and Willis and Madora. It’s a chemical thing and for a long time I didn’t even know what Willis and Madora looked like, forget about their chemistry. It’s a happy surprise when a character like Django appears all dressed up and ready to go. Mostly characters emerge like photographs did back in the day when the exposed sheets had to sit in trays of chemical developer. I remember standing in my uncle’s dark room, watching the paper as it began to darken into the shape of someone I knew. It was a magical, breath-holding moment. Would it work? I learned from my uncle that a good photograph required time and trust. Same with characters in books. With every new story, I have to trust that men and women like Madora and Willis are there on the paper waiting to reveal the shadows and lights of their lives. Trust that when they meet Django something will happen, a fire of some kind. Trust is the part where I always get hung up. In that sense, each new book is a spiritual exercise, a letting go and opening up to whatever picture of life emerges from the process.